Laika was originally a stray dog in Russia that became the first dog in space at the hands of the Soviet in 1957. Sadly, Laika perished within hours after the journey commenced. The Sun at Night follows an alternate history as Laika survives and returns to earth with new technology and helps the resistance with their plight. So far I'm two hours into the progression. 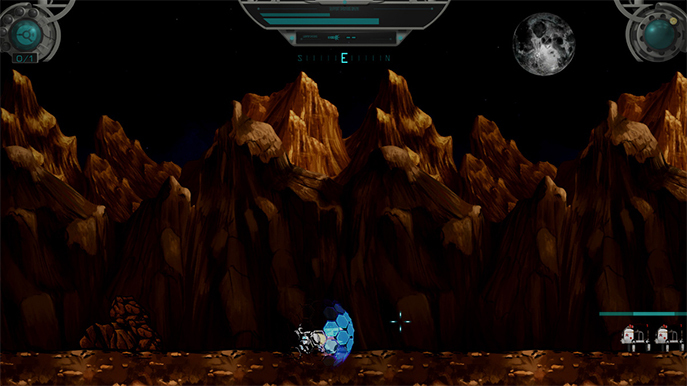 The Sun at Night is a 2d platformer with gorgeous artwork and an emphasis on tactical fighting. Upon re-entering Earth's atmosphere the capsule's systems failed and you are initially stranded. 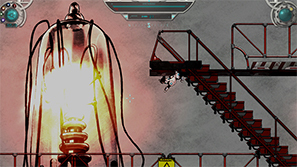 The brief introduction teaches you the various mechanics you'll need to use to survive. You are fitted with unusual technology that can produce a recharging shield that protects you from hazardous projectiles and enemies; draining every time it absorbs damage. You quickly find your blaster, and with the right analogue it can be rotated 360 degrees. It also has unlimited ammo and can be charged for a more damaging shot. After shooting some birds and completing the tutorial you meet a human, Abram. Abram is a little struck with what he sees before him. Laika can now communicate with humans and, thanks to her trusting eyes, is taken back to the camp of the resistance. The presentation can be a little overwhelming at first but it doesn't take long to become familiar with how the areas are set out. 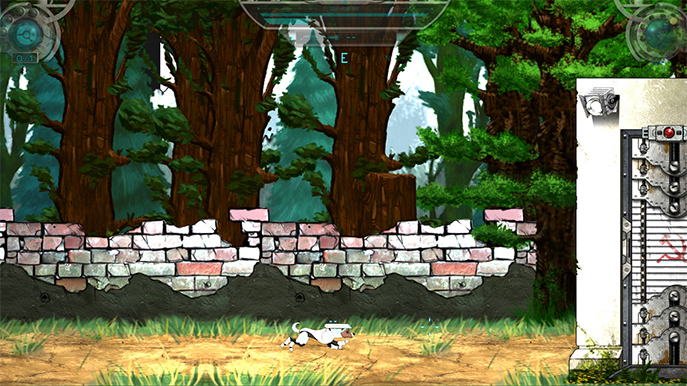 The first area is the camp and you are given various tasks to perform. Controlling Laika is comfortable and easy (I've been using an Xbox 360 controller). The areas are large with various doorways connecting rooms. You have access to a map but this takes a little getting used to. The map is a 3d representation of the overall area using 2d shapes as the rooms. It's fully functional but when you've explored a lot of the area it becomes a little clustered. Thankfully, by pressing left analogue you bring up an arrow pointing in the direction of your objective. I have used this considerably more than the full map. Once you are finished in the camp you begin your first full mission. Unfortunately for you, it starts badly. You awaken in a jail cell. After a mysterious individual breaks you out you begin contact with Viswanathan who advises you on your objectives. There are a good number of enemies here and you are required to get used to the shooting quickly. You cannot just run and gun enemies down. The blaster has a limited rate of fire so you have to let it cool down between bursts of shots. When the enemy fires at you the best course of action is to use your shield, absorb the damage then return fire. 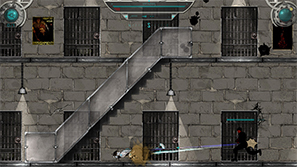 Starting with a fully charged shot gives you a good advantage as it takes more than 50% damage off basic enemies. At the area that I'm up to now the enemies are considerably tougher and more aggressive. Laika has a number of abilities at her disposal (though most are initially locked). There are three upgrade trees – offence, defence and utilities. The first ability you unlock is double jump. You can unlock these by collecting nano batteries. Abilities are unlocked with between 1 and 5 nano batteries. So far I've been concentrating on defensive abilities; I had noticed I was taking far too much damage and dying too often. I've been having fun in the early stages of The Sun at Night but there have been some frustrations along the way. The checkpoint system is brutal with save points a great distance apart. You won't find a save point just before some bosses and when you die you reload from the previous save. In my final game time before writing this article I moved through a door and an enemy had spawned right in the entrance. Before I could move it shot me once (I had over 50% health) and killed me. I was returned to about fifteen minutes before my point of death. This was overly frustrating as the area was pretty difficult to traverse. The Sun at Night is a difficult game too. You need to manage your inventory carefully, ensuring you're well stocked up on health kits and shield replenishers. You can fabricate these items from nano and find them across the map. 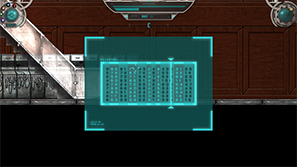 Laika can hack terminals too – an easy mini-game where you stop a bar on the static letters – that often gives you a choice of a save point or some nano. It felt a little unbalanced as I have chosen save most of the times so far so I lose the minimum progress upon death. If you are caught without any health kits in a tricky area you can find yourself dying over and over again or tracking back to try and find one you may have missed. I was left a little frustrated over the frequent loss of progress but maybe I just need to get better at the game. I have enjoyed most of it. It plays really well, looks great and has an immediately striking soundtrack. You have to carefully consider how you are going to get past most areas, rather than going in head first. The writing is good too; a balance between the serious setting and the more humourous interactions Laika has with dog things. 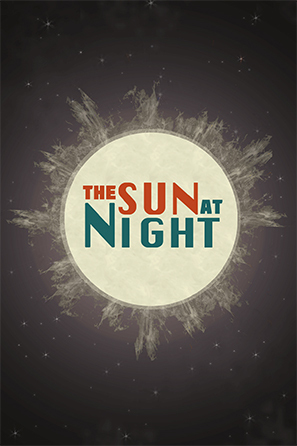 If you are looking for a tough tactical platformer with a memorable setting I would recommend The Sun at Night. I'm certainly looking forward to playing more.